Dandelions are darlings of the foraging community. They are entirely edible. Apparently, you can use the roots (dried then ground) in a coffee-like tincture. 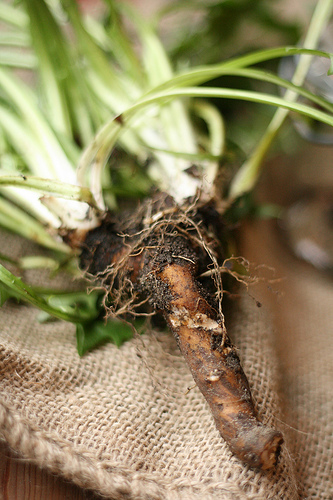 I have also read you can simply prepare/eat dandelion roots the same way you would other root vegetables. 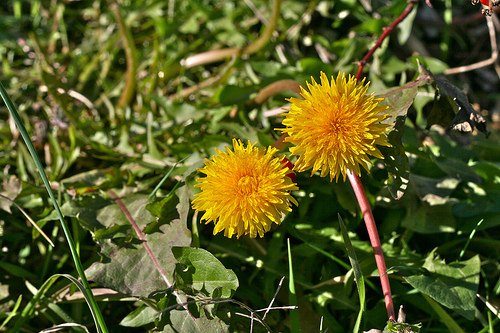 Herbalists use dandelion root to detoxify the liver and gallbladder, and dandelion leaves to support kidney function. Dandelion is a rich source of vitamins A, B complex, C, and D, as well as minerals such as iron, potassium, and zinc. Dandelion greens can be added to sandwiches, eaten in salads and dried to make tea. Dandelion greens are a bit bitter (younger leaves are less bitter) and many people prefer them cooked---including myself. My absolute favorite way to cook dandelion greens is 'creamed'---think of creamed spinach. With sweet leeks and cream, the bitterness is softened; try sauteed scallops served on creamed dandelion greens. Now when I walk by dandelions, and see their white puff-ball heads, it really REALLY makes me want to pluck them all and blow the seeds everywhere. Maybe when people are mortified that I am spreading 'weeds', I can hand them recipe cards---LOL.